I don't know how much of this blog post is going to make sense (Heck, I don't even know what I'm going to write yet!) so if you like well-thought-out discussions of issues that plague/terrify/enlighten/amuse, you have come to the wrong place. I have been a working woman in a dental office for a nearly two weeks now. I have subsisted on food-in-a-box (frozen dinners), cereal, bagged cut veggies, and pretzels. And chocolate. I just finished off the pretzels and all the rest of my food (including the chocolate) is at the office. Hopefully I'll survive until tomorrow morning. Although really, I could, if I were less tired, run over to Hy-vee, Target, or Walmart to get something (chocolate) to eat. But I'm too tired. Paul ran in the Dan Patch 5k race this morning. I'd been pestering him to do it for a few years, but he was always at scout camp or EFY or something. This year, he was home and said he wanted to do it. Registration was at 8 a.m., which is the time I rousted Paul from his deep sleep to get up. He clambered out of bed and stumbled into his running clothes. Jim took him to the starting line and dropped him off, then came to pick me up. We waited at the finish line and watched the rain clouds roll in. I was also on the phone with Jenni, until someone shouted "First runner is coming in!" We didn't expect Paul to be first, but we knew he'd be in the first pack. And he was. He came in 5th! 18:38 is his unofficial time. I forgot my camera, and didn't think to use the phone's camera, so you'll have to do without pictures. I have a new boss. He's a pretty cool guy. He has a dog that he brings to work. He eats my cereal that I brought in to the office. To make up for eating it, he took me out to dinner at Goss's and showed me the stuffed elephant head and a panoramic picture of some bison. He's an endodontist, which means he treats the roots of teeth. He's also my brother. I am now back from 5 days in South Dakota. I have 5 more to go next week, which will be focused mainly on learning new computer software for Mike's endo practice. I am pretty excited. I do have pictures, but I am too tired to post them right now. And I have scrub pants to hem up. Before school ended, I told Jim that I wanted to do something fun with whatever children we still have lying around the house before I had to start my new job. I wanted to do something that would get me out of the house and into the sunshine (but not directly into it. I am not a fan of being hot. Or sunburned) (and only into sunshine and not directly into nature. Because even the nature in my yard has tried to kill me. For example, the TICK from two days ago). 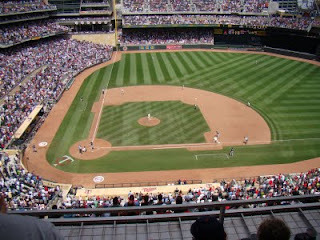 We decided on going to a Twins day game. We took Matt and Hayley. They were the only two kids I found in the house. Paul must be somewhere else (he's at EFY). Because I am a nervous downtown driver (and I like parking downtown even less), I opted to take the light rail from the Mall of America (or as we like to call it, Mollica Merica, thanks to an odd pronunciation by Matt when he was little. Or was it Paul?). Our lawn is conspiring against me. It has joined forces with THE ENEMY. After walking across our yard--a yard that has until now seemed friendly to us--Jim found a wannabe-ninja tick on his shoe, no doubt trying to assassinate my poor defenseless husband. If its mission had been successful, I'm sure the heartless marauder would have come after me. I will now be spending the rest of the summer safely inside my house. I am contemplating the addition of several clean rooms for persons entering the house where they will strip down to their skivvies and submit themselves to several body scans to make sure we as a household are not infiltrated by the shadowy murderous forces of Dermacentor variabilis. Did you know keys can multiply? If left alone to their own devices in containers on your dresser, two keys can turn into several dozen. I know this because I recently cleaned off my dresser, and in the process of going through two containers that held odds and ends, I came up with enough keys to outfit several janitors. I have no idea what the keys unlocked, so I threw them out based on the popular theory that if you haven't used something in the last year, you should get rid of it (this theory does apply to children, which is why I try to use mine as often as possible). I had no idea these keys even existed. Most of the pertinent pictures of my trip have already been posted by my sister but I thought I'd share maybe a few behind the scenes photos. I don't have many of me, but that's ok. Hopefully it's ok with my sister that I am going to post pictures of her family. 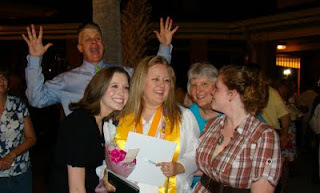 Travis is learning the art of the photobomber here, or he's REALLY happy that his daughter graduated. This next photo is a little deceptive. Jen looks completely relaxed and happy. But I think she got a little teary-eyed several times during the weekend. And of course she should be a little weepy; her daughter just graduated from high school. Maddie loves her kitties. This particular kitty, upon meeting me, climbed right up my leg and wanted to play. He loved the ties on my capris and would jump and run and cavort at nothing. Maddie is pretty cute too.This is pretty much my contribution to the weekend. I baked, mixed, and frosted. That there is 3 tiers, made from 8 layers of cake. Mmmmmmm cake! Last day of school and work. After today, I'll have yet another senior, and a freshman, and a 7th grader. Hold my horses, my baby will be in 7th grade! It is also my last day of work for a little while. It may very well be my last day of work at my particular job. I don't talk much about my job on this blog for privacy reasons, not my own privacy obviously, since I talk way too much about myself on here to consider this a private blog, but to protect the privacy of the children I work with. It has been a good job. I have enjoyed being around most of the children I've come to know. Most of them are friendly and happy, which makes me friendly and happy. I like my co-workers at both sites (I worked at two different places). They've all been easy to get along with and very helpful to a newbie (me). They made leaving home to go to work easy on a stay-at-home mom wannabe who hasn't been in the workforce for almost two decades. I am in Florida for one more night. I thought I would blog more, but it turned out that I spent my time doing more important things. So my list for tonight is Ten things that are more important than blogging while in Florida visiting my sister and her family for my niece Morgan's graduation. 1. Bake a cake. And when I say I baked a cake, I really baked 8 cakes. 8 layers to make 3 tiers. Picture later. So baking was done rather than blogging. 2. Make frosting. 8 batches of my own special buttercream icing. I had *niecial help in the area of counting cups of powdered sugar. Maddie was the official counter, Rozzie was the backup counter, and Morgan was the assistant to the backup counter. I tend to miscount the number of cups of powdered sugar so I needed their special counting skills. Thank you girls! 3. Assemble a cake. It took some time to assemble the layers in the right order. You can't put a rectangle layer with a circular layer to make a tier. But Delta tried their very best to prevent me from getting there. When mom and I got to Memphis, we rushed to the gate to catch our connecting flight. Not a minute after getting there, the gate attendant announced there would be an indefinite delay. A few minutes later, another person got on the intercom and said, "We have a maintenance problem. This plane is broke." I had a giggle at that. Either the plane's wallet is extra, or it is cracked in half down the middle. And that was the last of my laughing. Not that we were in danger of being stuck forever in terminal limbo, but....sob...we were forced to RUN. I have RUNNING pictures. I didn't take them, though. They were taken by another track team parent. So thanks, Julie! I couldn't go to Paul's track meet because (sigh) I had to work til 6 p.m. So I missed Paul's new personal best. 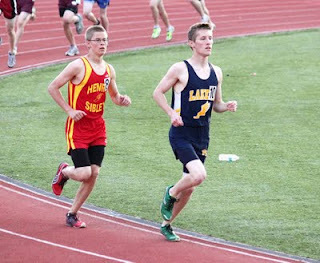 He ran the 3200m in 10:31. I have a hard time backing the van out of the garage in 10 1/2 minutes! He's temporarily airborne:He makes it look easy. Last night was his last run for this year in track. One more year! Switching gears, yes, I'm supposed to be packing. My mother and I are leaving for Florida this afternoon to attend Morgan's graduation (Morgan is my niece). I am very excited! Jenni and I coordinated the births of our children so that none of them graduate in the same year (ha! not really) so we can each concentrate on only one graduate each year. I promise I'll blog while I'm gone. Also today was the last day of seminary.